The word Amankora combines the Sanskrit for peace with the Bhutanese for pilgrimage. That is exactly what you will find in the first luxury hotel to appear in Bthutan. You will also find out why Amankora has featured in such places as the Condé Nast Hot List. The six nature-linked lodges are nestled in a stunning Himalayan valley. The 72 suites feature natural rammed-earth walls, gently sloping roofs and wood-panelled interiors. They are furnished with king-size beds, traditional bukhari (wood-burning stoves) and large terrazzo-clad baths. You will enjoy views, either of the fabulous courtyard, the nearby Wangdicholing Palace and monastery, or to the expanses of rice fields and pine forest in the valley. Amankora has everything you need to relax, from a yoga suite to extensive spa facilities. Bhutan is the sole surviving Himalayan Buddhist Kingdom. With peaks of 7000 metres in the north to low lying plains in the south, the country offers some of the most breathtaking scenery in the world. 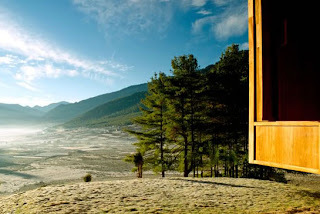 To experience the best of what Bhutan has to offer, Amankora can tailor journeys that include a combination of its lodges located in the valleys of Paro, Thimphu, Punakha, Gangtey and Bumthang. The rich topography affords visitors an opportunity for unique journeys of discovery, in an eco-system sustained by centuries of Buddhist philosophy and traditions.